I call him Jester Jack purely because of his acrobatic displays whilst diving and turning in strong winds. And coming from a family of ‘circus cousins’ I’m quite sure that this Jackdaw (Corvus monedula) would easily get a job in the Big Top! I spotted this young bird with its pale eyes, trying to catch a bit of sun. He appeared totally oblivious to me taking a picture of him or perhaps he really is a show off and was just a wee bit dramatic. 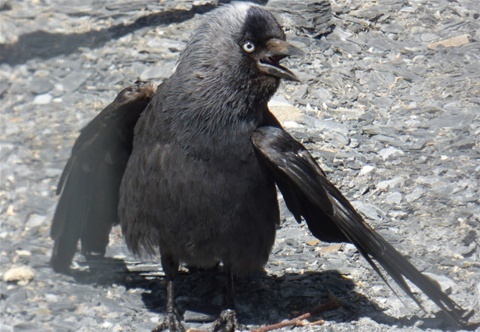 Known for their ‘nimble thieving claws’ these sociable birds cannot resist shiny objects, perhaps that is why they are called Jack, a name traditionally used when referring to a thief or a rogue. Not that long ago, just as I lit the fire at our home for waifs and strays, I heard a squawking and flapping noise coming from up the chimney. Faster than you could say ‘fireman’ I beat out the fire and forced the chimney pipe off the stove to discover nothing more than a very lucky-to-be-alive Jack the Jester! Perhaps that should be a lesson to him!